Crickard, Frederick William, Rear-Admiral, OMM, CD, RCN (Ret’d) – 81, passed away peacefully at the Halifax Infirmary, on Saturday July 21st, with family at his side. Born in Vancouver in 1930, he was the only son of the late Frederick and Carrie (Robson) Crickard. Growing up, he attended St. George’s School in Vancouver, and then the Canadian Services College, Royal Roads in Victoria, from 1948-1950. In 1950, following in his father’s footsteps, he joined the Navy. In 1955, he specialized as a gunnery officer in HMS Excellent, Portsmouth, England. During his career, he served ashore and at sea, on both Canadian coasts, and was given command of three Canadian ships: HMCS Sussexvale (1965-66); HMCS Fraser (1968-1969); HMCS Provider (1972-1974). In 1971, he received his BA in Political Science from Dalhousie University. He was awarded the Order of Military Merit in 1979. 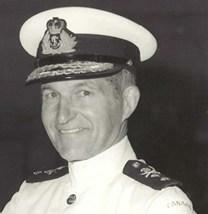 His final naval appointment was in 1983, as Deputy Commander of Maritime Command, and in 1985, he retired from the Navy. Still very interested in naval matters, he joined the Supplementary Reserve and began to speak and write on defence policy issues. In 1988, he became a member of the National Board of Directors of the Naval Officer’s Association of Canada (NOAC), and was elected National President in 1995. He received a Masters Degree in Political Science (International Relations), in 1993 from Dalhousie University, and joined the Faculty of Dalhousie University as Research Associate with the Centre for Foreign Policy Studies, speaking and publishing on Maritime Security and Oceans Policy issues, from 1988 until his retirement in 1996. Fred was an avid reader, a great listener of music, an outdoor enthusiast, and a true gentleman. In the 1940’s, he began mountain climbing with his father and friends around Vancouver, which led to climbing expeditions in the Yukon (St. Elias range) and in New Zealand (Mt. Cook), in the 1950’s and 1960’s. Devoted husband of 49 years to Margaret (Henderson) Crickard. Dear-hearted father to Nancy. Much loved Grandpa of Anya and Tasha. Caring father-in-law to David Munro and Uncle to Scott, John, and David Aikman, and to Anne (Aikman) Quimby. Loyal friend to many. Predeceased by his only sister, Helen (Robson) Aikman. He will be fondly remembered by all. Grateful thanks to Dr. O’Brien, Dr. Kim, and the nurses and staff at the Halifax Infirmary. Cremation has taken place. A memorial service to celebrate his life will be held on Friday, September 14th, 2pm, at St. Brendan’s Naval Chapel, Stadacona. Burial of his ashes at sea, will take place at a later date. Family flowers only. Donations in his memory, if desired, may be made to The Mission to Seafarers Halifax, or to the Maritime Awards Society of Canada, Victoria, B.C.